Many people are overwhelmed by customs laws, duties and commodity codes and prefer any professional service to handle all compliance on their behalf. We offer custom document preparation as a standard service to all clients and customs clearance services in limited areas/countries. If you need these, please tell us. We will help you prepare all relevant documents so that you can clear customs without hassle. We also advise you about various inspection certificates, license, etc., needed in your country. This service is free for those who avail our shipment services. We can customs clear on your behalf and deliver to your doorsteps thereby taking away all headaches involving shipment, logistics and customs clearance. Currently this service is available for certain countries only. To know about customs duties and tax calculation, please visit our customs FAQ pages. The documents needed for custom clearance largely depends on the country where the furniture will be imported and used. It is best to check with the customs department or a customs broker in your country before importing furniture or any other goods in general. Following are some common documents that are needed for custom clearance in most cases. The shipper can give commercial invoice in any form or design, but it must include following information to qualify as a commercial invoice. The name and address of the importer which can be either a real person or a legal entity. Quantity of goods, unit of measure, gross and net weight, preferably accompanied with a packing list bearing invoice number, date and name of the importer. A value expressed as price per unit and total value. It is important that the amount of the invoice is written in numbers as well as words to avoid any confusion. The commercial invoice should be in English as it is acceptable to all those countries are signatory to the Warsaw Convention. The packing list is not a required document, but it is helpful in identifying the products imported. It is extremely important for furniture importer because there are too many unique items that needs to be identified in case of field check by customs department or when receiving goods in the warehouse. A good packing list would contain the package number, description of item and quantity in that package, gross and wet weight, dimension of the package expressed in cubic meter. In addition, the shipping mark, transport method, invoice number and importer's detail should be mentioned in the packing list. The shipping or transport documents are important as they required customs clearance of imported goods. The most common transport document is Bill of Lading and Airway Bill. Goods sent by sea requires a Bill of Lading whereas air shipment needs an Airway Bill. They are both same in functionality except B/L is a negotiable instrument. The Bill of Lading is an important document that serves as proof of receipt of goods by a carrier. It also defines its contractual obligation to deliver the goods to the title holder of the B/L. Airway Bill does not pass on the title of the goods, but it serves as evidence of the contract of carriage and proof of delivery. Insurance cover is very cheap and should be taken to protect your imported furniture during transit. The insurance cover is not a required document for customs clearance however, it is advisable to obtain suitable cover because the shipping company may not cover transit losses. It will generally not cover losses arising out of fire, loading mistake, nautical mistake by the crew, strikes, lockouts, jettison of goods in order to save lives or force majure. The insurance cover is available for as little as 1% of the value of the goods. 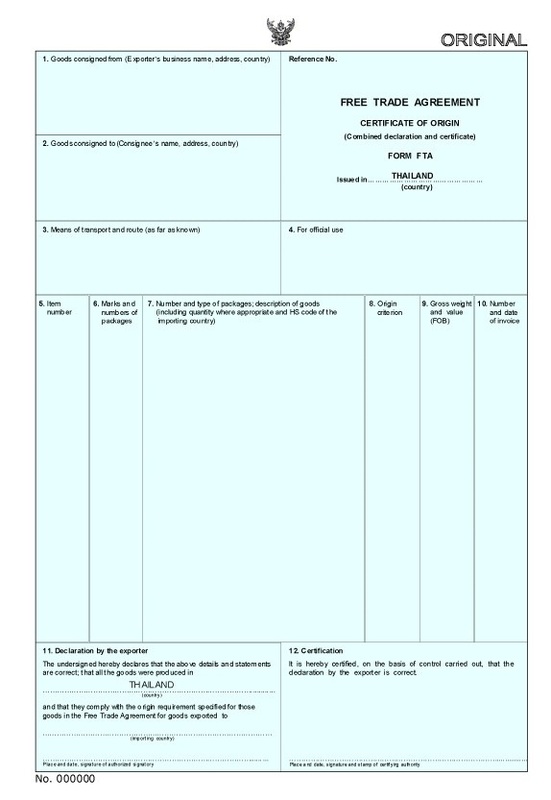 A Certificate of Origin (CO) is a document which is used for certification that the products exported are wholly obtained, produced or manufactured in a particular Country. It is generally an integral part of the export documents. The requirement of CO varies from country to country. In most cases a simple declaration from the exporter is sufficient for ascertaining country of origin of the goods. Some Arab countries may require CO to be notarized by their embassy so it is better to check before shipment of your furniture. In general, if there is a treaty between China and your country for reduction in duty for goods made in China, you may be required to submit a country of origin certificate. A preferential CO that is generally needed to obtain a reduced import tariff if a agreement exist between China and the importing country. Fumigation or pest control certificates are generally needed if furniture or packing material is made of solid wood. It is strictly enforced in countries like Australia and New Zealand, where failure to comply may result in quarantine risk. The fumigation must be carried out at the time of loading container and a certificate must be obtained by a recognized authority appointed by the government.